Every December, Vancouver celebrates the winter holidays with lots of attractions and fantastic light displays. One of the Top 6 Vancouver Holiday Light Displays--and the one that is the most uniquely Vancouver--is the annual Carol Ships Parade of Lights. Taking place on the waters in and around downtown Vancouver, the Carol Ships Parade of Lights is a nightly procession of festive, decked-out-in-holiday-lights boats that runs Fridays and Saturdays, December 2 - 17, 2016. The Carol Ships Parade of Lights began 50 years ago with just one boat; today, over 50 boats join the festival, cruising Coal Harbour and False Creek, carrying 30,000 people over the month of December. The boats are both commercial cruises--for which you can buy tickets--and the private boats of Vancouverites who love to join in. How Can I Enjoy the Vancouver Carol Ships Parade of Lights? Assuming you don't have your own boat (if you do, you can join in), there are two ways to enjoy the Carol Ships Parade of Lights: Go on a ticketed public cruise or watch the Parade from a free, shore-side event. 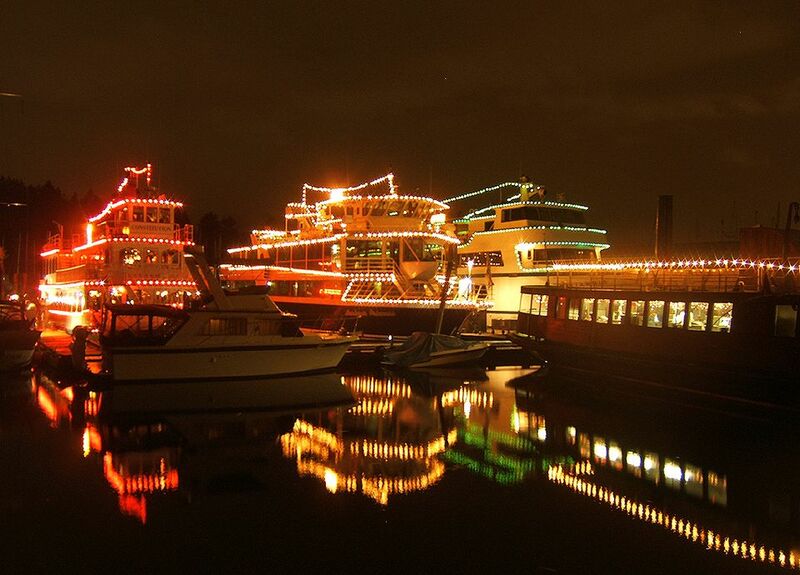 Commercial cruises that participate in the Carol Ships Parade of Lights usually leave from Coal Harbour (near Stanley Park, on the north side of downtown Vancouver's West End) or Granville Island (on the inlet waters of False Creek). Cruises are about two to three hours in length and usually include dinner, Christmas carols, and other entertainment. (Yes, many have bars on board, too.) Tickets for the dinner cruises typically run around $45 - $75 per person, with discounts for young children. The Carol Ships Parade of Lights made my list of the best Free Vancouver Christmas & Holiday Attractions because you can enjoy the lights for free at a shore-side event. Of course, you can also watch for free any night of the festival (Fridays and Saturdays, December 2 - 17, 2016). December 3, 2016: Watch the Carol Ships from the free North Vancouver Christmas Festival at Shipbuilders’ Square. December 10, 2016, at 7:30pm - 8pm: Watch the Parade from Canada Place, on the waterfront in Downtown Vancouver. December 16, 2016, at 8:15pm: Watch the Parade from Port Moody. December 17, 2016, from 7:30pm - 9pm: Watch and celebrate the Carol Ships in Deep Cove, North Vancouver. For more information on the Vancouver Carol Ships Parade of Lights, see the Carol Ships Parade of Lights Society website.